Use these 3 simple adjustments to make your handwriting fonts for Microsoft Word documents look more realistic – and more like real handwriting. The following diagrams show how to perform the above adjustments. To create a “bumpy baseline,” first select the word to move up or down and then open your font settings using Control-D (Windows) or Command-D (Mac). Then select the advance tab and move the Position up or down just a point or two. To make a ragged left margin, type a carriage return (enter) at the end of the lines so you can adjust each line separately. Then use the ruler to adjust the left margin by very small increments in or out. Finally, change the line spacing just a little from one line to the next. Make some lines a single space apart, and others 1.2 or .8 apart. 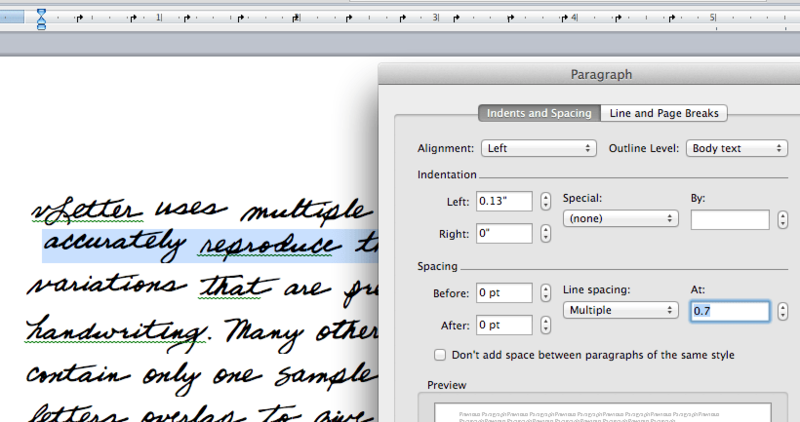 Try different amounts until you get a more “human” appearance in the use of your handwriting font. Don’t overdo any of these subtle adjustments, and soon you’ll be rewarded with a, “I can’t believe that’s a font!” when you show your print-out to others! NOTE: These enhancements are especially effective when used on the addresses of envelopes!